Mature Height 15 - 30 ft. Mature Width 4 - 8 ft.
Wisteria is perhaps the most beautiful climbing plant in the world, but it needs a lot of room. The Amethyst Falls Wisteria a selection of a native North American wisteria, that is much more manageable and smaller that the Chinese of Japanese kinds, so it is suitable for smaller gardens and smaller locations. It has similar long clusters of flowers in a gorgeous shade of lavender-blue, with the extra bonus of flowering not just in spring, but again in summer. This is the ideal vine for a pergola, arbor or trellis panels on a sunny wall. With its amazing color it will bring a touch of luxury and elegance to any space, without taking over your whole garden. 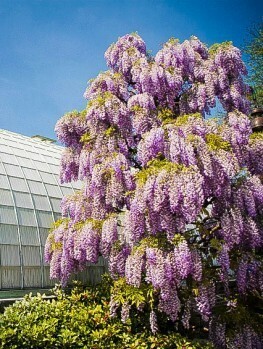 The Amethyst Falls Wisteria should be planted in a sunny location for maximum flower production. It will grow in any well-drained soil, but benefits from a richer soil and fertilizer while young. Some pruning will give more flowers and keep it neat, but it will stay a reasonable size and not engulf your garden. If you have always wanted a Wisteria, but were afraid of the size, the Amethyst Fall Wisteria is exactly what you have been looking for. Climbing plants have a place in every garden, for covering arbors, unsightly fences or walls, or for growing on a trellis to give height without width in a small garden. 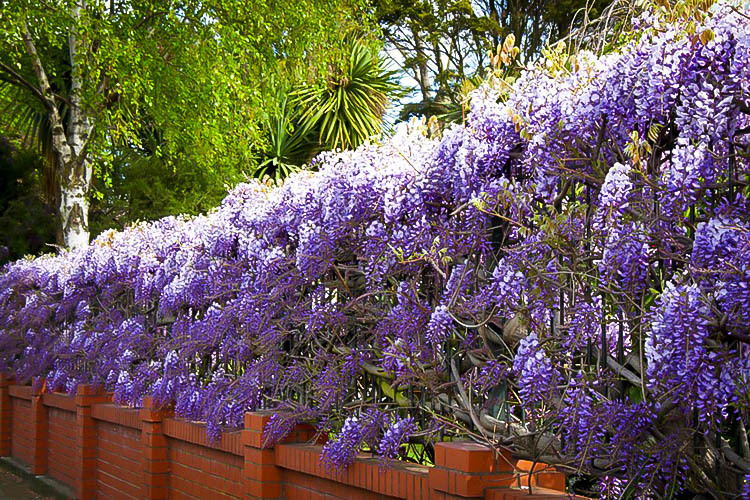 Among the different kinds of climbing plants, Wisteria vines stand out for the beauty of their flower clusters and their dramatic blue to purple coloring. 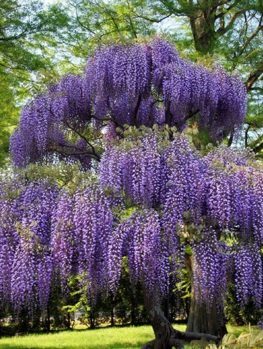 However, many people have had bad experiences with Wisteria, because the most commonly available form is the Chinese or Japanese Wisteria – a beautiful plant, but one that can grow 100 feet and completely engulf a large tree, spreading around the garden like a beautiful monster. So when you say ‘Wisteria’ to some gardeners, they can turn very pale! 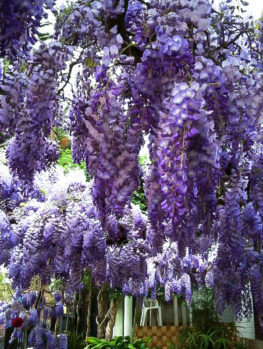 Luckily there is a solution for those who love the look and color of Wisteria, but don’t have the huge amount of space needed to grow the classic Chinese Wisteria. 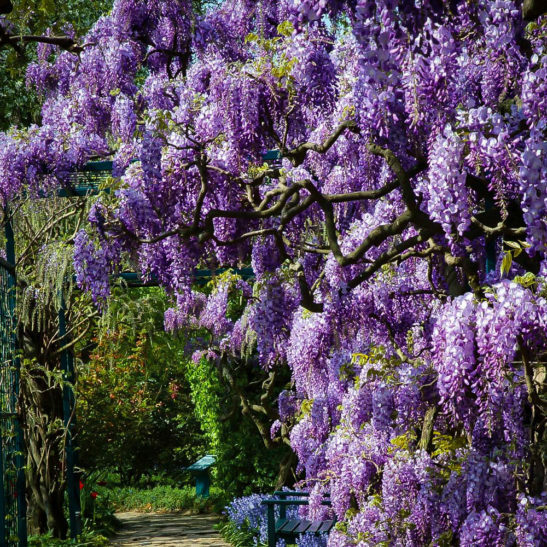 In some parts of the country, the Chinese Wisteria has even escaped into natural areas and become a major pest. However, there is a solution that allows us to grow this beautiful plant, without having to live with a monster, or threaten the surrounding countryside. Believe it or not, America has its own Wisteria species, which for years was overlooked by gardeners keen to grow something exotic. All across the eastern USA, from Virginia to Illinois, and south to Florida and Texas, grows a well-behaved all-American Wisteria called Wisteria frutescens. (The ‘bad’ ones are Wisteria sinensis and W. floribunda). This plant mostly grows around streams and ponds in the wild, but in the garden it will grow well in most kinds of soil. It still makes a good-sized plant, but nothing like the alien monsters. 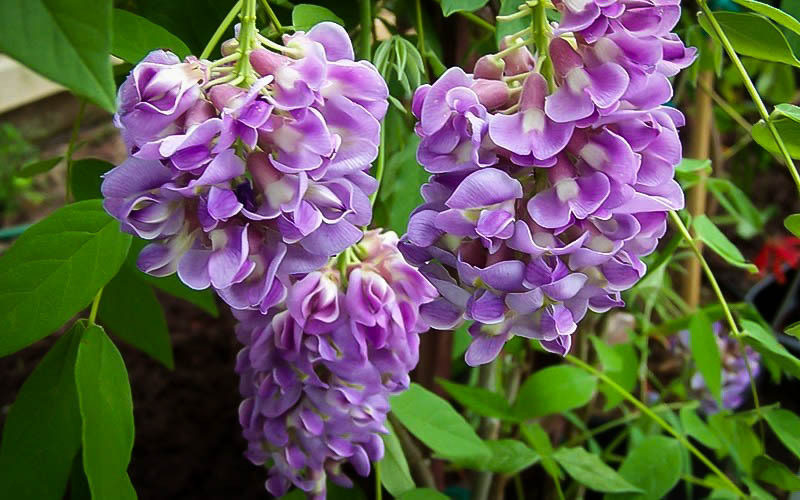 It has more delicate stems that are easily pruned or trimmed, and unlike the Chinese or Japanese wisterias, which can take years to bloom, our American Wisteria will bloom within a couple of years of planting. Gardeners have selected an especially attractive form of the American wisteria, and called it ‘Amethyst Falls’. The Amethyst Falls Wisteria has clusters of beautiful flowers up to six-inches long that begin looking like a blue pine cone, before expanding to their full length. The flowers are like those of a pea, because this plant is in fact a relative of that vegetable, but they are larger, and a ravishing shade of lavender blue, with a delicious light scent. As an added bonus, these flowers are not only produced in spring, just before the leaves emerge, but also in summer, set against the attractive foliage. The leaves are large, up to 12 inches long, but they are divided into 15 smaller leaflets, like a fern, giving the plant a light, airy beauty. The slender stems will twine around any support, so you do not need to tie this vine in, it will cover a trellis or arbor naturally. When planting your Amethyst Falls Wisteria, make sure to place it in a sunny location. It will also grow in partial shade, but the amount of flowering will be reduced, so we recommend a location in full sun. It grows well in any garden soil that is not constantly wet, but does best in a moist, well-drained soil that is rich in organic material. Add compost or manure when planting, and mulch each spring with more organic material. Unlike the regular Wisteria, which can take 7–10 years to flower, your Amethyst Falls Wisteria will be flowering with 2 or 3 years from planting. Give young plants plenty of water, but once established this plant will tolerate an average dry summer without extra care. Although relatively ‘tame’, you should still give your Amethyst Falls Wisteria plenty of room, on a strong trellis or arbor. It will also grow up into a tree, so if you have a dead tree looking unsightly on your property, this is a great way to turn it into a thing of beauty. Pruning is beneficial to control the size but even more because it will help your plant produce lots of flowers. Prune twice a year – first in fall or winter, when the plant is dormant, by cutting stems back to the large buds you will see at their base. These are the flower buds. Then prune again in summer, by trimming back any long stems you don’t need to extend your vine over its support. Cut them back to about 6 inches in length. Always cut just above a leaf or bud. Everyone who sees Wisteria falls in love with it, but you need to be careful in your selection if you want to avoid letting a monster loose, so the Amethyst Falls Wisteria is the perfect choice. However, these plants are always rare and hard to obtain, so our supplies will not last. Order now and finally enjoy a Wisteria vine you can live with and love forever. All of our Amethyst Falls Wisteria vines are produced from cuttings of plants guaranteed to be of the correct kind, so avoid cheaper plants labeled simply ‘Wisteria’, as these will probably be the common Chinese or Japanese kinds that can grow to be 100 feet long and completely take over your garden. We invite you to browse our entire collection of Wisteria, including other popular species like the Blue Moon Wisteria and the Purple Wisteria.